Citation Information: J Clin Invest. 2019;129(1):296-309. https://doi.org/10.1172/JCI123284. Sepsis causes a biphasic translation derangement. (A and B) Time-course analysis of global protein synthesis in a murine model of sepsis (LPS, 5 mg/kg tail vein, i.v. ), as determined by incorporation of puromycin to growing polypeptide chains in vivo. Kidneys were harvested 30 minutes after puromycin administration at various time points in the sepsis timeline. Representative Western blot and its quantification are shown. (C) Imaging of nascent protein synthesis in kidney tissues using O-propargyl-puromycin (OPP), an alkyne analog of puromycin, in vivo. Alexa Fluor 555–azide was conjugated to OPP by copper(I)-catalyzed azide-alkyne cycloaddition (Click chemistry). Prox, proximal tubules; dist, distal tubules/collecting ducts. Original magnification, ×60. (D and E) Polysomal profiling of kidney extracts from mice treated with LPS for indicated durations. Cycloheximide was injected at the time of sacrifice to prevent the release of ribosomes from the cognate mRNA. Ribosomal subunit 40S, 60S, mono-ribosome (80S), and polyribosomes were separated using sucrose density gradient. 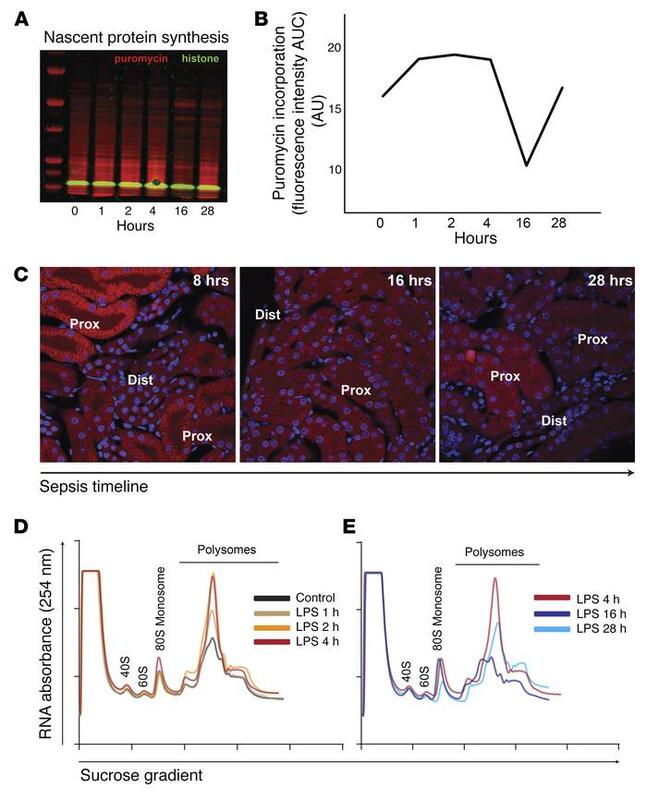 (D) Increased mono-ribosome and poly-ribosome signals indicating increased protein synthesis are observed in the early phases of sepsis (LPS, 1, 2, and 4 hours). (E) Increased mono-ribosome, but decreased poly-ribosome, fractions indicating initiation block and decreased protein synthesis are observed 16 hours after LPS administration. Representative UV absorbance traces from each time point are overlaid, and for comparison, an identical trace (LPS, 4 hours) is shown in both D and E. Polysome-to-monosome ratios: 3.0, 3.5, 4.7, 3.1, 1.9, and 3.7 at 0, 1, 2, 4, 16, and 28 hours, respectively.